As with any job, our goal is always (or should be) to do our very best. To make ourselves “Indispensable” to the company/ministry we serve. Now understand… “Indispensable” doesn’t mean that your office can’t run without you. A truly Indispensable assistant makes certain that things flow smoothly whether they are present or not (see Trait #2 below). How do you do that without losing yourself in the process? 1. Dependability – your pastor can count on you to do what you say, when you say you’re going to do it. 2. Organization – this trait spills over into other areas like time management, productivity and effectiveness. If you’re not organized, other areas suffer. 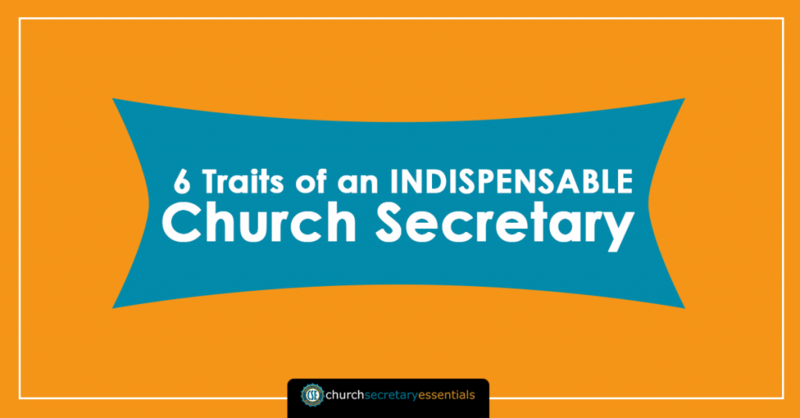 The organized church secretary has the proper processes and has systems that allow for automation and delegation. 3. 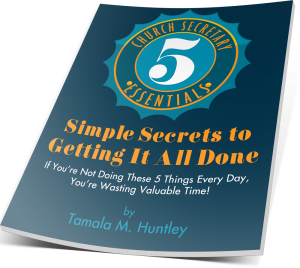 Takes Action (Self Motivated) – your pastor doesn’t have to tell you everythingyou need to do. You take initiative to figure things out on your own and get things done without constantly being coached and pushed. 4. Follows Through to Completion – this is a BIGGIE. Nothing may bother a pastor more than thinking a project has been completed, only to come back and find out that it was left “hanging”. This trait is the mark of a superstar! 5. Not Easily Offended – a church secretary with this trait is able to listen and take constructive criticism without being offended. There will be plenty of opportunity for offenses to come! Knowing this, you develop thick skin, make good communication a priority and always seek to resolve issues rather than let them fester. 6. Calmness – this is a weird one… but when you have this trait, you bring calmness to your church office and to your pastor. He/she can “rest” because they know that you are capable and competent. They don’t have to micro-manage you and can focus on feeding the people. You make his/her load easier. If you don’t have these traits… work on it. Simple as that. You can’t develop muscles that you won’t exercise so have a gameplan… focus on 1 new trait a month until you master them. Some of them may come easy to you while others don’t. You have it in you!